On this 90 minute historic, ghostly walking tour in uptown Charlotte you'll be guided by lantern light, listening to the stories and haunts of local history. Explore the sites where some of Uptown's departed inhabitants are said to still linger. See some of Charlotte's famous and sometimes infamous landmarks, and learn how the ghostly past has shaped the city of Charlotte today. Charlotte was founded in 1768 and has witnessed the country's birth and growth. With that growth has come much turmoil and led to many ghostly encounters. There is much to learn about the area that was founded on an ancient Indian trading path and is home to landmarks both haunted and historic. Meeting close to the heart of Uptown, you will begin your 1.5 hour tour and step further and further back into time throughout the stops. Strolling through Charlotte's Fourth Ward district, you'll visit some of the area's most notable and haunting sites. 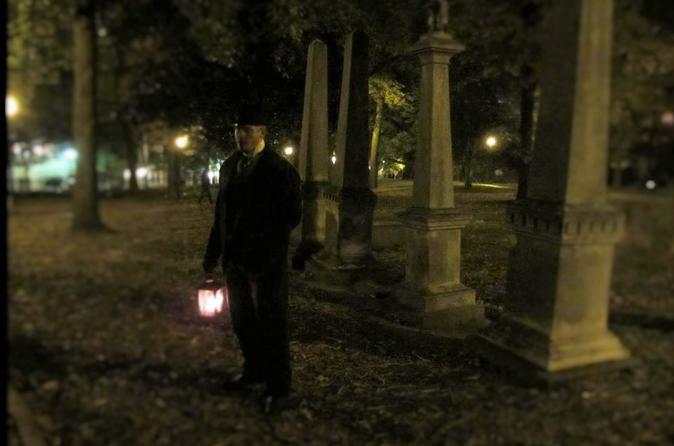 Tours feature visits to various ghostly and historic spots, like the path to Charlotte, tunnels of grave fortune, theatrical ghosts and some of Uptown's magnificently spooky houses. You'll learn about significant people and battles, see where both the drinking of spirits and ghostly spirits intersect, and walk past ghoulish medical institutions. Visit haunting locations where people currently lay to rest, and haunting locations where people were permanently laid to rest. This tour is sure to educate and spook all who walk.